DIE Veneris, 1 die Julii. E. of Northumberland discharged of his Post of High Admiral. Letters going to Holland intercepted. Jackson, Earl of Warwick's Servant, Privilege. Delinquents sent for. Thanks to Lord Willoughby, for putting the Lincoln Militia in Execution. Mr. Wilmot's Letter to Mr. Crosis. Commission of Array for Leicestershire. Scots Paper annexed to the Book of Rates. Abstracts of Letters from Newcastle. Earl of Newcastle's Warrant to the Sheriff, &c. to raise the Durham Militia to garrison Newcastle. Reasons a gainst bringing Soldiers into Newcastle. 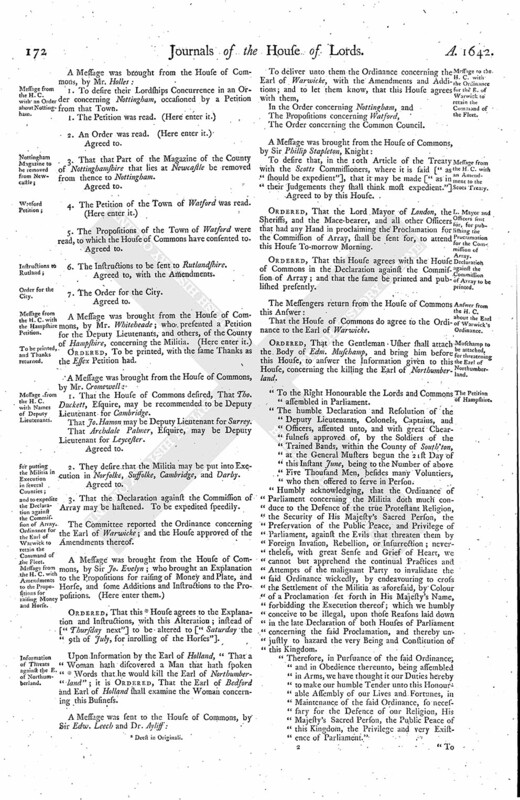 Amendments to the Book of Rates, annexed to the Tonnage and Poundage Bill. 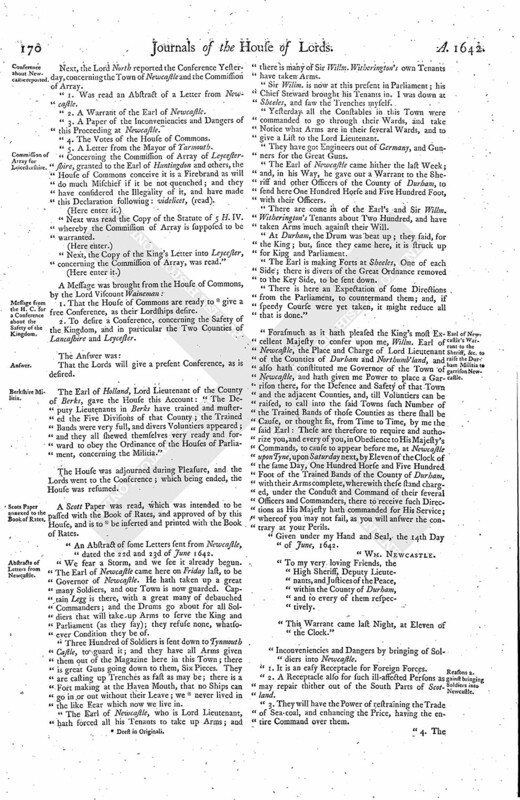 Ordinance authorizing the Earl of Warwick to continue in his Command of the Fleet. Message from the H. C. with an Order about Nottingham. Message from the H. C. with the Hampshire Petition. To be printed, and Thanks returned. Message from the H. C. with Names of Deputy Lieutenants. and to expedite the Declaration against the Commission of Array. Ordinance for the Earl of Warwick to retain the Command of the Fleet. Message from the H. C. with Amendments to the Propositions for raising Money and Horse. Information of Threats against the E. of Northumberland. Message to the H. C. with the Ordinance for the E. of Warwick to retain the Command of the Fleet. Message from the H. C. with an Amendment to the Scots Treaty. L. Mayor and Officers sent for, for publishing the Proclamation for the Commission of Array. Declaration against the Commission of Array to be printed. Answer from the H. C. about the Earl of Warwick's Ordinance. Muschamp to be attached, for threatening the Earl of Northumberland. The Petition of the Mayor, &c. of Nottingham. The Inhabitants of Watford's Petition, wherein they offer 1276 l. and Horse. Propositions by the Inhabitants of Watford, concerning raising Horse. Order for executing the Militia of Nottinghamshire. Common Council to provide a Place for the Arms that came from Hull. Ordinance for the Earl of Warwick to remain in his Command of the Fleet. Watford Propositions for raising Money and Horse, assented to. Letter from Mr. Brereton, about the Lancashire Militia and Magazine. Instructions for Deputy Lieutenants, concerning the Propositions for bringing in Money and Horse. The Lord North was appointed to fit Speaker this Day. The Earl of Northumberland acquainted this House, "That Yesterday he received a Letter from the King, to discharge him of being Admiral." And this House Resolved, To communicate this to the House of Commons, to consider how the Fleet and the Kingdom may be secured; and to let them know that, being it concerns them, the Lords have resolved nothing yet therein. To desire a Free Conference, concerning the Lord Admiral, and the Safety of the Kingdom. The Earl of Northumb. acquainted this House, "That some Letters were intercepted going for Holland, by the Ships that lie on the Northern Coast, and sent to his Lordship, which do concern the Safety of the Kingdom." A Letter was read, written from Mr. Henry Willmott, to Mr. Crofts, in Holland, dated the 22d June, 1642. Ordered, That this Letter be communicated at this Conference to the House of Commons. Ordered, That Jackson, a menial Servant of the Earl of Warwicke, being arrested, contrary to the Privilege of Parliament, shall be released; and Rob. Reynolds and Edw. Ridley shall be sent for, to answer the same. The House gave Thanks to the Lord Willoughby of Parbam, Lieutenant of Lyncolneshire, for his Fidelity and Care in performing the Commands of this House, in putting the Militia into Execution. "For Mr. Crofts, at The Hague." Next, the Lord North reported the Conference Yesterday, concerning the Town of Newcastle and the Commission of Array. "1. Was read an Abstract of a Letter from Newcastle. "2. A Warrant of the Earl of Newcastle. "3. A Paper of the Inconveniencies and Dangers of this Proceeding at Newcastle. "4. The Votes of the House of Commons. "5. A Letter from the Mayor of Yarmouth. "Concerning the Commission of Array of Leycestershire, granted to the Earl of Huntingdon and others, the House of Commons conceive it is a Firebrand as will do much Mischief if it be not quenched; and they have considered the Illegality of it, and have made this Declaration following: videlicet, (read). "Next was read the Copy of the Statute of 5 H. IV. whereby the Commission of Array is supposed to be warranted. "Next, the Copy of the King's Letter into Leycester, concerning the Commission of Array, was read." 1. That the House of Commons are ready to (fn. 1) give a free Conference, as their Lordships desire. 2. To desire a Conference, concerning the Safety of the Kingdom, and in particular the Two Counties of Lancashire and Leycester. That the Lords will give a present Conference, as is desired. The Earl of Holland, Lord Lieutenant of the County of Berks, gave the House this Account: "The Deputy Lieutenants in Berks have trained and mustered the Five Divisions of that County; the Trained Bands were very full, and divers Voluntiers appeared; and they all shewed themselves very ready and forward to obey the Ordinance of the Houses of Parliament, concerning the Militia." A Scott Paper was read, which was intended to be passed with the Book of Rates, and approved of by this House, and is to (fn. 1) be inserted and printed with the Book of Rates. "An Abstract of some Letters sent from Newcastle, dated the 22d and 23d of June 1642. "We fear a Storm, and we see it already begun. The Earl of Newcastle came here on Friday last, to be Governor of Newcastle. He hath taken up a great many Soldiers, and our Town is now guarded. Captain Legg is there, with a great many of debauched Commanders; and the Drums go about for all Soldiers that will take up Arms to serve the King and Parliament (as they say); they refuse none, whatsoever Condition they be of. "Three Hundred of Soldiers is sent down to Tynmouth Castle, to guard it; and they have all Arms given them out of the Magazine here in this Town; there is great Guns going down to them, Six Pieces. They are casting up Trenches as fast as may be; there is a Fort making at the Haven Mouth, that no Ships can go in or out without their Leave; we (fn. 1) never lived in the like Fear which now we live in. "The Earl of Newcastle, who is Lord Lieutenant, hath forced all his Tenants to take up Arms; and there is many of Sir Willm. Witherington's own Tenants have taken Arms. "Sir Willm. is now at this present in Parliament; his Chief Steward brought his Tenants in. I was down at Sheeles, and saw the Trenches myself. "Yesterday all the Constables in this Town were commanded to go through their Wards, and take Notice what Arms are in their several Wards, and to give a List to the Lord Lieutenant. "They have got Engineers out of Germany, and Gunners for the Great Guns. "The Earl of Newcastle came hither the last Week; and, in his Way, he gave out a Warrant to the Sheriff and other Officers of the County of Durham, to send here One Hundred Horse and Five Hundred Foot, with their Officers. "There are come in of the Earl's and Sir Willm. Witherington's Tenants about Two Hundred, and have taken Arms much against their Will. "At Durham, the Drum was beat up; they said, for the King; but, since they came here, it is struck up for King and Parliament. "The Earl is making Forts at Sheeles, One of each Side; there is divers of the Great Ordnance removed to the Key Side, to be sent down. "There is here an Expectation of some Directions from the Parliament, to countermand them; and, if speedy Course were yet taken, it might reduce all that is done." "Forasmuch as it hath pleased the King's most Excellent Majesty to conser upon me, Willm. Earl of Newcastle, the Place and Charge of Lord Lieutenant of the Counties of Durham and Northumb'land, and also hath constituted me Governor of the Town of Newcastle, and hath given me Power to place a Garrison there, for the Defence and Safety of that Town and the adjacent Counties, and, till Voluntiers can be raised, to call into the said Towns such Number of the Trained Bands of those Counties as there shall be Cause, or thought fit, from Time to Time, by me the said Earl: These are therefore to require and authorize you, and every of you, in Obedience to His Majesty's Commands, to cause to appear before me, at Newcastle upon Tyne, upon Saturday next, by Eleven of the Clock of the same Day, One Hundred Horse and Five Hundred Foot of the Trained Bands of the County of Durham, with their Arms complete, wherewith these stand charged, under the Conduct and Command of their several Officers and Commanders, there to receive such Directions as His Majesty hath commanded for His Service; whereof you may not fail, as you will answer the contrary at your Perils. "Given under my Hand and Seal, the 14th Day of June, 1642. "To my very loving Friends, the High Sheriff, Deputy Lieutenants, and Justices of the Peace, within the County of Durham, and to every of them respectively. "This Warrant came last Night, at Eleven of the Clock." "Inconveniencies and Dangers by bringing of Soldiers into Newcastle. "1. It is an easy Receptacle for Foreign Forces. "2. A Receptacle also for such ill-affected Persons as may repair thither out of the South Parts of Scotland. "3. They will have the Power of restraining the Trade of Sea-coal, and enhancing the Price, having the entire Command over them. "4. The well-affected People there will be much discouraged (as they have been too much already), by putting in of these Forces; and the Papists thereabouts will be much encouraged (wherewith Northumberland and the Bishoprick do much abound); and the Part of the malignant Clergy (which is strong there also) will be ready to join with them. "5. A Fear of begetting a Jealousy betwixt the Two Nations of England and Scotland, and breaking the Pacification. "This is done by a Warrant sent from the Earl of Newc. to the Sheriff, Deputy Lieutenants, and Justices of Peace, of the Bishoprick of Durham, reciting a Warrant of His Majesty's, who hath made him Lord Lieutenant of the Counties of North'land and Durham, and Governor of Newcastle, and giving him Power to place a Garrison there. "1. This is illegal, because all Commissions of Lieutenancy, etc. declared to be against Law. "2. The drawing of armed Men out of one County into another, by any Warrant or Command, videlicet, out of the Bishoprick of Durham into North'land, where Newcastle is situate, is also against Law. "1. A Declaration of the Illegality of this Proceeding, and a Command to the Inhabitants of the Counties of Durham and North'land to suffer no such Forces to go out of their Counties, nor to send any such into Newcastle; and an Inhibition to the Inhabitants of Newcastle to receive any. "2. Two of the King's Ships to be sent thither, to guard the Mouth of The Tyne, and to receive and execute from Time to Time the Directions of the Parliament. "3. That a Declaration shall be made, to set forth the Illegality of these Proceedings at Newcastle; and that the County Palatine of Durham be enjoined, not to suffer any of their Trained Bands to go to Newcastle, to be garrisoned there; and that the Town of Newcastle be required not to permit any of them to be received into Garrison. "That Two of the King's Ships shall be appointed to lie at the River's Mouth of Tyne, for the Preservation of that Place; and prevent the Inconveniences that may happen by the Fort there in building. "That the Lords be moved, to join in these Votes." Henry Massey saith, "Right off Tilmouth Haven, as he came Cloise Van Heof, sometimes in the Bushes is now a Captain, in a small Bable-hoy, with Twentyfive Men and Two Falcons; forced him to hoist out his Boat, and came aboard, taking away from him Two Kettles, Five Muskets, Powder, Shot, Flag, and Ancient, Two Barrels of Beer, Twelve Capple Fish, and some Bread, and pillaged divers of the Men of all their Cloaths, taking from Massey the Value of Ten Pounds; and threatens to deal with as many of the Fishermen both from Wesmome and North Seas as he can meet with, and to deal with Colliers for Stock. This is reported by Massey; and that, after this being done, he fell (fn. 2) in with one Captain Johnson in a Ship that serves the King and Parliament, and told him of this Rogue. This Captain Johnson reported to Massey, That he sent his Boat into Tynmouth Haven for fresh Water, but could not be suffered to have it, there being Eighty Men at Work about fortifying, and to make a Fort for Ordnance, besides the old Castle, and that he fears all will be naught there; yet we shall not neglect to dispatch Monus and The Dove Spooner to Sinderland. "To (fn. 3) Mr. Thomas Johnson." The Lord North is appointed to be Speaker this Afternoon. The Lord North reported the Conference this Morning with the House of Commons: "That the House of Commons have received some Letters from Rotterdam, from a private Gentleman, that wishes well to his Country. "Further it was informed, That there is great Preparation of Arms and Ammunition, and Two Thousand Horse, in Holland, to come for England; of which the House of Commons have been informed by divers Hands." An Ordinance of Parliament was read, to authorize the Earl of Warwicke to remain in his Charge in the Fleet. E. of Holland. L. Wharton. Next, was read these Papers following, concerning Lancashire. 1. The Warrant of the High Sheriff of Cheshire. 2. A Letter to Mr. Hampden and Mr. Goodwin, from Sir Wm. Brereton. 3. Another, to the Speaker of the House of Commons, from Sir Wm. Brereton. 4. Another Letter, written to the Earl of Stamford. 1. To desire their Lordships Concurrence in an Order concerning Nottingham, occasioned by a Petition from that Town. 3. That that Part of the Magazine of the County of Nottinghamshire that lies at Newcastle be removed from thence to Nottingham. 5. The Propositions of the Town of Watford were read, to which the House of Commons have consented to. 6. The Instructions to be sent to Rutlandshire. Agreed to, with the Amendments. 7. The Order for the City. Ordered, To be printed, with the same Thanks as the Essex Petition had. 1. That the House of Commons desired, That Tho. Duckett, Esquire, may be recommended to be Deputy Lieutenant for Cambridge. That Jo. Hamon may be Deputy Lieutenant for Surrey. That Archdale Palmer, Esquire, may be Deputy Lieutenant for Leycester. 2. They desire that the Militia may be put into Execution in Norfolke, Suffolke, Cambridge, and Darby. 3. That the Declaration against the Commission of Array may be hastened. To be expedited speedily. The Committee reported the Ordinance concerning the Earl of Warwicke; and the House approved of the Amendments thereof. Ordered, That this (fn. 4) House agrees to the Explanation and Instructions, with this Alteration; instead of ["Thursday next"] to be altered to ["Saturday the 9th of July, for inrolling of the Horses"]. Upon Information by the Earl of Holland, "That a Woman hath discovered a Man that hath spoken (fn. 4) Words that he would kill the Earl of Northumberland"; it is Ordered, That the Earl of Bedford and Earl of Holland shall examine the Woman concerning this Business. The Order concerning the Common Council. Ordered, That the Lord Mayor of London, the Sheriffs, and the Mace-bearer, and all other Officers that had any Hand in proclaiming the Proclamation for the Commission of Array, shall be sent for, to attend this House To-morrow Morning. 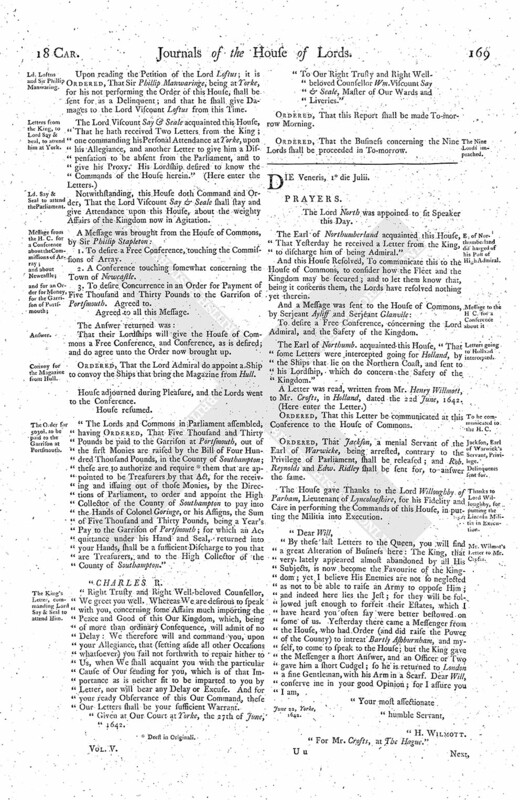 Ordered, That this House agrees with the House of Commons in the Declaration against the Commission of Array; and that the same be printed and published presently. That the House of Commons do agree to the Ordinance to the Earl of Warwicke. Ordered, That the Gentleman Usher shall attach the Body of Edm. Muschamp, and bring him before this House, to answer the Information given to this House, concerning the killing the Earl of Northumberland. "The humble Declaration and Resolution of the Deputy Lieutenants, Colonels, Captains, and Officers, assented unto, and with great Chearfulness approved of, by the Soldiers of the Trained Bands, within the County of South'ton, at the General Musters begun the 21st Day of this Instant June, being to the Number of above Five Thousand Men, besides many Voluntiers, who then offered to serve in Person. "Humbly acknowledging, that the Ordinance of Parliament concerning the Militia doth much conduce to the Defence of the true Protestant Religion, the Security of His Majesty's Sacred Person, the Preservation of the Public Peace, and Privilege of Parliament, against the Evils that threaten them by Foreign Invasion, Rebellion, or Insurrection; nevertheless, with great Sense and Grief of Heart, we cannot but apprehend the continual Practices and Attempts of the malignant Party to invalidate the said Ordinance wickedly, by endeavouring to cross the Settlement of the Militia as aforesaid, by Colour of a Proclamation set forth in His Majesty's Name, forbidding the Execution thereof; which we humbly conceive to be illegal, upon those Reasons laid down in the late Declaration of both Houses of Parliament concerning the said Proclamation, and thereby unjustly to hazard the very Being and Constitution of this Kingdom. 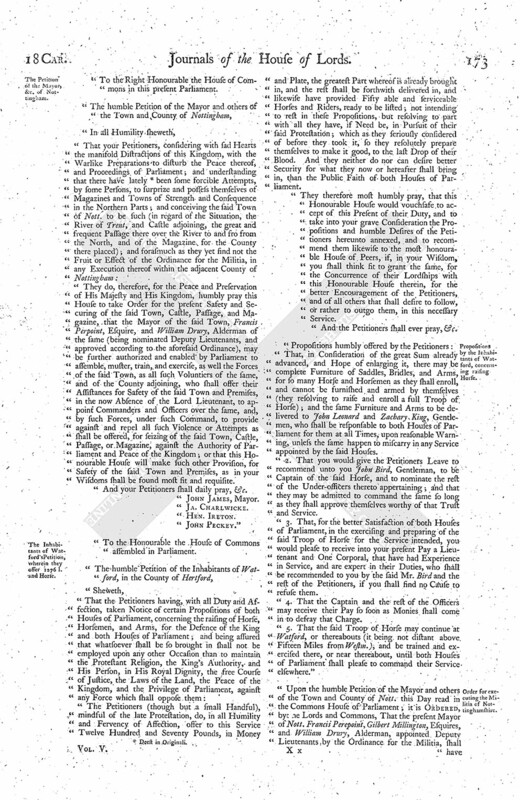 "Therefore, in Pursuance of the said Ordinance, and in Obedience thereunto, being assembled in Arms, we have thought it our Duties hereby to make our humble Tender unto this Honourable Assembly of our Lives and Fortunes, in Maintenance of the said Ordinance, so necessary for the Defence of our Religion, His Majesty's Sacred Person, the Public Peace of this Kingdom, the Privilege and very Existence of Parliament." "To the Right Honourable the House of Commons in this present Parliament. "They do, therefore, for the Peace and Preservation of His Majesty and His Kingdom, humbly pray this House to take Order for the present Safety and Securing of the said Town, Castle, Passage, and Magazine, that the Mayor of the said Town, Francis Perpoint, Esquire, and William Drury, Alderman of the same (being nominated Deputy Lieutenants, and approved according to the aforesaid Ordinance), may be further authorized and enabled by Parliament to assemble, muster, train, and exercise, as well the Forces of the said Town, as all such Voluntiers of the same, and of the County adjoining, who shall offer their Assistances for Safety of the said Town and Premises, in the now Absence of the Lord Lieutenant, to appoint Commanders and Officers over the same, and, by such Forces, under such Command, to provide against and repel all such Violence or Attempts as shall be offered, for seizing of the said Town, Castle, Passage, or Magazine, against the Authority of Parliament and Peace of the Kingdom; or that this Honourable House will make such other Provision, for Safety of the said Town and Premises, as in your Wisdoms shall be found most fit and requisite. "To the Honourable the House of Commons assembled in Parliament. "The Petitioners (though but a small Handful), mindful of the late Protestation, do, in all Humility and Fervency of Affection, offer to this Service Twelve Hundred and Seventy Pounds, in Money and Plate, the greatest Part whereof is already brought in, and the rest shall be forthwith delivered in, and likewise have provided Fifty able and serviceable Horses and Riders, ready to be listed; not intending to rest in these Propositions, but resolving to part with all they have, if Need be, in Pursuit of their said Protestation; which as they seriously considered of before they took it, so they resolutely prepare themselves to make it good, to the last Drop of their Blood. And they neither do nor can desire better Security for what they now or hereafter shall bring in, than the Public Faith of both Houses of Parliament. "They therefore most humbly pray, that this Honourable House would vouchsafe to accept of this Present of their Duty, and to take into your grave Consideration the Propositions and humble Desires of the Petitioners hereunto annexed, and to recommend them likewise to the most honourable House of Peers, if, in your Wisdom, you shall think fit to grant the same, for the Concurrence of their Lordships with this Honourable House therein, for the better Encouragement of the Petitioners, and of all others that shall desire to follow, or rather to outgo them, in this necessary Service. "And the Petitioners shall ever pray, &c.
"That, in Consideration of the great Sum already advanced, and Hope of enlarging it, there may be complete Furniture of Saddles, Bridles, and Arms, for so many Horse and Horsemen as they shall enroll, and cannot be furnished and armed by themselves (they resolving to raise and enroll a full Troop of Horse); and the same Furniture and Arms to be delivered to John Leonard and Zachary King, Gentlemen, who shall be responsable to both Houses of Parliament for them at all Times, upon reasonable Warning, unless the same happen to miscarry in any Service appointed by the said Houses. "2. That you would give the Petitioners Leave to recommend unto you John Bird, Gentleman, to be Captain of the said Horse, and to nominate the rest of the Under-officers thereto appertaining; and that they may be admitted to command the same so long as they shall approve themselves worthy of that Trust and Service. "3. That, for the better Satisfaction of both Houses of Parliament, in the exercising and preparing of the said Troop of Horse for the Service intended, you would please to receive into your present Pay a Lieutenant and One Corporal, that have had Experience in Service, and are expert in their Duties, who shall be recommended to you by the said Mr. Bird and the rest of the Petitioners, if you shall find no Cause to refuse them. "4. That the Captain and the rest of the Officers may receive their Pay so soon as Monies shall come in to defray that Charge. "5. That the said Troop of Horse may continue at Watford, or thereabouts (it being not distant above Fifteen Miles from Westm. ), and be trained and exercised there, or near thereabout, until both Houses of Parliament shall please to command their Service elsewhere." "Upon the humble Petition of the Mayor and others of the Town and County of Nott. this Day read in the Commons House of Parliament; it is Ordered, by the Lords and Commons, That the present Mayor of Nott. Francis Perepoint, Gilbert Millington, Esquires, and William Drury, Alderman, appointed Deputy Lieutenants by the Ordinance for the Militia, shall have Power to train, and exercise in Arms, as well the Forces of the Town, as all such Voluntiers of the same Town and County adjoining, who shall offer their Assistance; and, in the Absence of the Lord Lieutenant, to appoint Officers and Commanders over the same; and that Henry Ireton, Esquire, be nominated to be Captain of a Horse Troop, and Charles White, Esquire, to be Captain of a Foot Company. "It is this Day Ordered, by the Lords and Commons assembled in Parliament, That the Citizens which serve for the City of London do repair to the Lord Mayor, who is hereby required forthwith to call a Common Council, to consider of some convenient Place or Places, within the City of London and Liberties thereof, where the Arms and Ammunition brought from Hull may be with most Safety laid up and reserved, for such Use and Uses, for the Defence of the King and Kingdom, as both Houses of Parliament shall hereafter order and appoint; and the said Common Council is likewise to appoint some fit Persons to receive the said Arms and Ammunition, by Inventory, from out of the Ships where now they are; and shall likewise nominate and appoint some skilful Workmen to make clean and to keep clean the said Arms, from Time to Time, as Need shall require, until both Houses of Parliament shall otherwise dispose of them; which Officers and Workmen, together with House-rent and all other Charges incident thereunto, shall be satisfied and paid by Order and Direction of one or both Houses of Parliament, according as shall be agreed upon by such Persons as the Common Council shall nominate and appoint for that Purpose." "Whereas the Earl of Northumberland, a Person of known Integrity and Honour, in whom the King and Kingdom might safely conside, is lately discharged by His Majesty from being Lord High Admiral of England; the Lords and Commons in Parliament assembled have, for the Safety of His Majesty's Person, the Parliament and Kingdom, in this Time of imminent Danger, by Ordinance of the said Lords and Commons, Ordained, That you, Robert Earl of Warwick, shall command in chief the Ships of the Fleet now at Sea, and shall have Power to grant Commissions, and to remove or displace all Officers, and other Persons whatsoever under your Command, and to place others in their Rooms, and to do all other Acts in as ample Manner as any Admiral hath formerly done, till further Order shall be taken by both Houses of Parliament; and all Officers, Mariners, and Soldiers, belonging to the said Fleet, and also all Commanders of Forts, are hereby required to yield Obedience unto you, the said Earl of Warwicke, in all Things concerning that Service: And it is further Ordained, That you, Robt. Earl of Warwick, and all Officers, Soldiers, and Mariners, obeying your Commands in this Service, for the Safety of the Kingdom, shall, for your and their Indemnity, be protected by the Authority of the said Houses of Parliament." 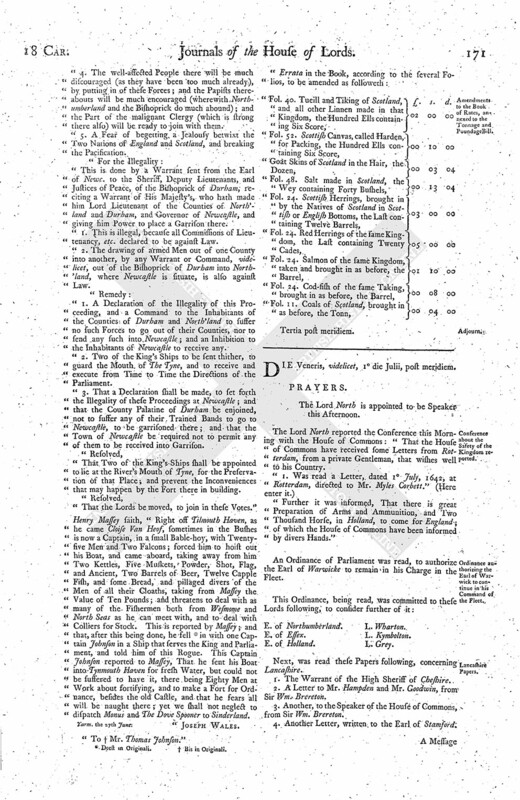 The Petition of the Inhabitants of Watford, in the County of Hertford, concerning their advancing of Twelve Hundred and Seventy Pounds, in Money and Plate, and Fifty able and serviceable Horses and Riders, together with Five Propositions touching the same, was this Day sent up from the House of Commons to their Lordships, with Desire of their Lordships Approbation and Concurrence therein; which Petition and Propositions being read, their Lordships do very well approve of the said Petition, and do concur in their Assent to the said Propositions. "Out of the Sense of that Duty I owe to the Service of the King and Parliament, and to the Peace of this Country, and particularly to the Security of the Town of Manchester (which deserves all possible Care and Endeavour for their Safety and Protection); I am induced to intrude myself into this Employment, which I had rather with too much Officiousness take upon me, than omit to advertise that which may require the speedy Resolution and Direction of the Parliament, though it may be you may receive more perfect Information from some of the Committee, whom it doth more properly concern. "Herein I will restrain myself only to what hath passed since Mr. Fogge's Departure from Manchester, who was sent up with an Express to the Parliament. Upon Saturday, at my coming to Manchester, I found those who are intrusted with the Execution of the Militia for Lancashire divided in their Opinions; amongst whom (though I had no Vote) I did so far interpose as to deliver my Opinion in that which by Vote was carried against those with whom I concurred; which inasmuch as it seems to me to be of mighty Consequence, I have taken the Boldness to represent the same unto you, that so, if you think fit to offer the same to the House, such further Directions may be given as may conduce to the Public Peace. "I found the Town of Manchester and the Country up in Arms, in Defence of their Magazine, which I hear was by Force attempted to be taken from them; and finding the Town so resolute, and the Country so forward and well-affected to make good this Defence, I did advise and persuade that they would speedily and vigorously go on with the Execution of the Ordinance for the Militia, as not knowing by what other Means they could be secured against the Power of such Force as was reported to be threatened, and might unexpectedly rush upon and surprize them. 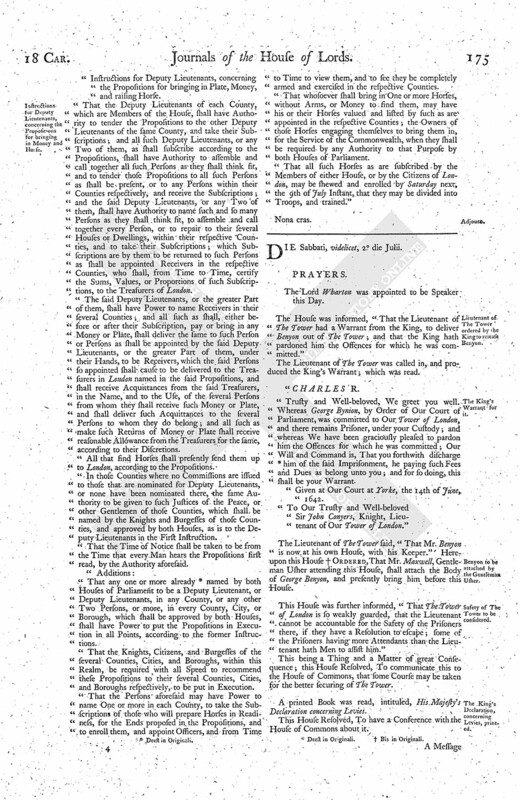 "This was the earnest Desires of many of those in the Town and Country who are best affected; and therefore I was very tender that the Town or the Country should receive no Discouragement by the Desisting and Delay of Proceeding in such a Way as might justify and make good this Defence of the Magazine, in Pursuit of the Directions of both Houses of Parliament, whereby this brave Town might be secured, who have behaved themselves so as to deserve Encouragement, rather than to be exposed to the Danger of being plundered by the Papists, or other malignant Spirits, whereof there are too many in that County and Neighbourhood: But these Gentlemen, who were of a contrary Opinion, and seemed not to apprehend so much Danger (perhaps knowing something of their own Knowledge which might incline them thereunto), and did out-vote the rest, declared, That they conceived, that, if they should enter upon the Ordinance for the Militia, they were not able to prosecute and go through with the Execution thereof, and therefore thought fit to suspend the same; which I fear may much disadvantage and prejudice the Cause, unless the Lord Wharton come down in Person, or some Assistance be speedily sent from the Parliament, whereunto I shall not need much to incite and persuade you, who may receive such further Information as is requisite from this Bearer, to supply what is by me omitted. Dunham, this 18 Junii, 1642. "To my very Worthy and Much-esteemed Friends, Mr. John Hampden and Arthur Goodwynne, Esquires. These, present." "Instructions for Deputy Lieutenants, concerning the Propositions for bringing in Plate, Money, and raising Horse. 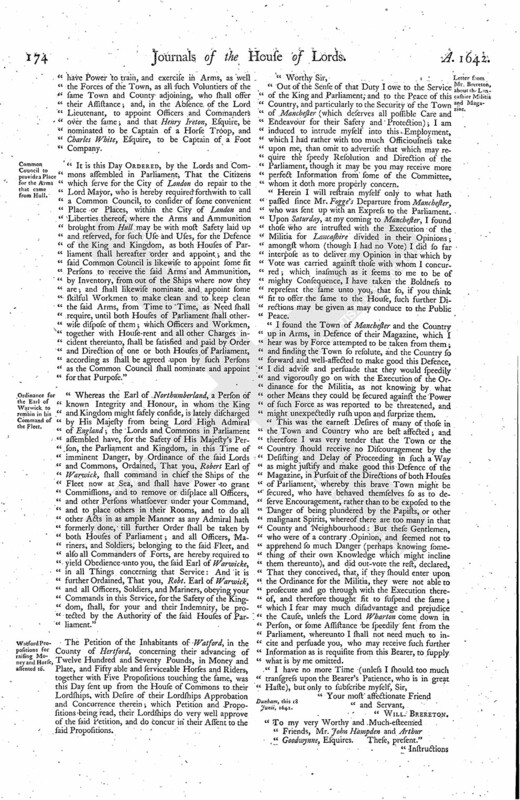 "That the Deputy Lieutenants of each County, which are Members of the House, shall have Authority to tender the Propositions to the other Deputy Lieutenants of the same County, and take their Subscriptions; and all such Deputy Lieutenants, or any Two of them, as shall subscribe according to the Propositions, shall have Authority to assemble and call together all such Persons as they shall think fit, and to tender those Propositions to all such Persons as shall be present, or to any Persons within their Counties respectively, and receive the Subscriptions; and the said Deputy Lieutenants, or any Two of them, shall have Authority to name such and so many Persons as they shall think fit, to assemble and call together every Person, or to repair to their several Houses or Dwellings, within their respective Counties, and to take their Subscriptions; which Subscriptions are by them to be returned to such Persons as shall be appointed Receivers in the respective Counties, who shall, from Time to Time, certify the Sums, Values, or Proportions of such Subscriptions, to the Treasurers of London. "The said Deputy Lieutenants, or the greater Part of them, shall have Power to name Receivers in their several Counties; and all such as shall, either before or after their Subscription, pay or bring in any Money or Plate, shall deliver the same to such Person or Persons as shall be appointed by the said Deputy Lieutenants, or the greater Part of them, under their Hands, to be Receivers, which the said Persons so appointed shall cause to be delivered to the Treasurers in London named in the said Propositions, and shall receive Acquittances from the said Treasurers, in the Name, and to the Use, of the several Persons from whom they shall receive such Money or Plate, and shall deliver such Acquittances to the several Persons to whom they do belong; and all such as make such Returns of Money or Plate shall receive reasonable Allowance from the Treasurers for the same, according to their Discretions. "All that find Horses shall presently send them up to London, according to the Propositions. "In those Counties where no Commissions are issued to those that are nominated for Deputy Lieutenants, or none have been nominated there, the same Authority to be given to such Justices of the Peace, or other Gentlemen of those Counties, which shall be named by the Knights and Burgesses of those Counties, and approved by both Houses, as is to the Deputy Lieutenants in the First Instruction. "That the Time of Notice shall be taken to be from the Time that every Man hears the Propositions first read, by the Authority aforesaid. "That any one or more already (fn. 6) named by both Houses of Parliament to be a Deputy Lieutenant, or Deputy Lieutenants, in any County, or any other Two Persons, or more, in every County, City, or Borough, which shall be approved by both Houses, shall have Power to put the Propositions in Execution in all Points, according to the former Instructions. "That the Knights, Citizens, and Burgesses of the several Counties, Cities, and Boroughs, within this Realm, be required with all Speed to recommend these Propositions to their several Counties, Cities, and Boroughs respectively, to be put in Execution. "That the Persons aforesaid may have Power to name One or more in each County, to take the Subscriptions of those who will prepare Horses in Readiness, for the Ends proposed in the Propositions, and to enroll them, and appoint Officers, and from Time to Time to view them, and to see they be completely armed and exercised in the respective Counties. "That whosoever shall bring in One or more Horses, without Arms, or Money to find them, may have his or their Horses valued and listed by such as are appointed in the respective Counties; the Owners of those Horses engaging themselves to bring them in, for the Service of the Commonwealth, when they shall be required by any Authority to that Purpose by both Houses of Parliament. "That all such Horses as are subscribed by the Members of either House, or by the Citizens of London, may be shewed and enrolled by Saturday next, the 9th of July Instant, that they may be divided into Troops, and trained."